Since I moved to Michigan six years ago, spring has taken on an intense form of meaningfulness. The long gray winters here are really hard to take for this girl from the Southwest. It is not the cold. I don't find it to be that cold. It is not the snow. I rather like the snow. It is the gray skies. Day after day of gray skies. The same gentle angle of the sun that allows me to grow hydrangeas and impatiens in full sun in the summer brings long winter days where the sun barely makes an appearance. The sun here is just not the same. I didn't even wear sunglasses for the first five years. I wanted to soak in every. single. little. bitty. piece. of sunshine. I finally let my ophthalmologist convince me that I needed sunglasses to protect my eyes - even here. But even sunglasses can't take away my joy on those first days in April (usually) when the sun shines full and bright. The words "Then sings my soul" swell in my heart. Maybe this is a little sad, but I look forward to those first days like very few other things during the span of a year. In reality it is not just the sunshine that makes me happy. It is hope. Hope that soon there will be flowers. Ummmm. I love flowers. Flowers make me happy. 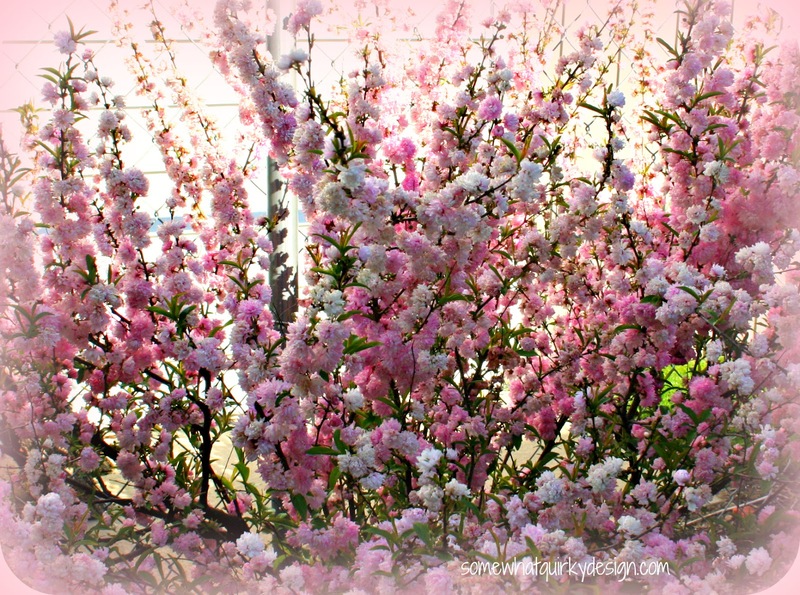 The first thing in my garden that blooms in full is my Flowering Almond bush. When my hostas are just inches out of the ground and bleeding heart has only a few little bleeding hearts, I can count on the flowering almond to bring a smile to my face. 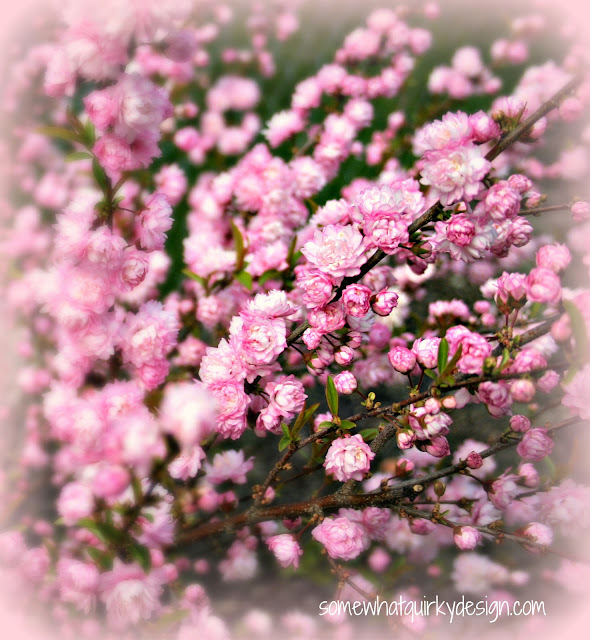 So today when I have a jillion projects hanging over my head and worst of all I'm out of CAKE, I thought I would just have a little flowering almond pictorial. It is so beautiful! The only bad thing is they blooms only last about two weeks. Then it is over. Dislike. Then I have to move on to dogwoods. Fickle. Flower Fickle. That's what I am. I understand how you feel about the gray skies of winter (I'm a Hoosier). I had never heard of a flowering almond bush. WOW--so beautiful! Wow, Those are gorgeous, how sad they only last two weeks! I just wanted to drop in and say hello....so HELLO! PS. There is this cake at my local grocery store that I swear I can eat the whole cake! Seriously! 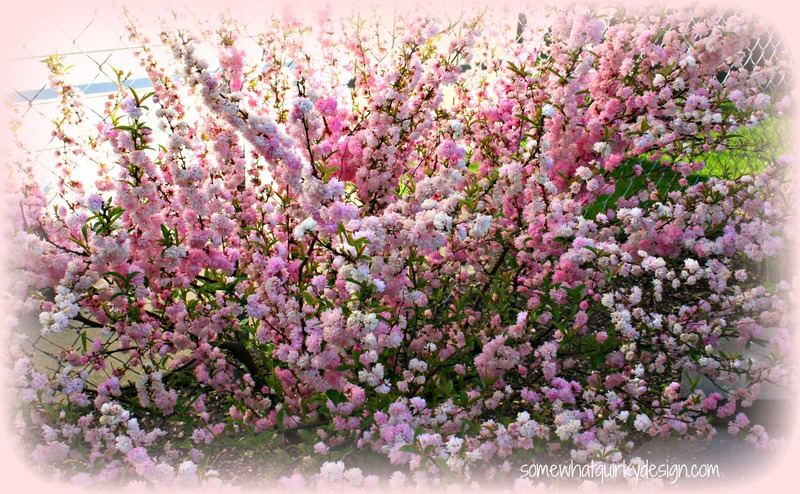 Love your pictures of your flowering almond bush. My neighbor used to have one in her front yard and I loved it. Thanks for sharing yours and for stopping by my blog. 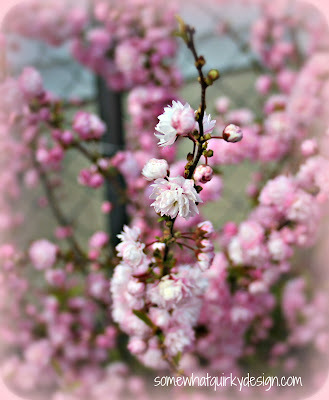 so pretty,and I too had never heard of this one,love the color satuation of pink tones. My plant I wait for is our Jasmine,I have it on my Blog. I miss snow,and aspens changing in the fall. I grew up in the Black Hills area of SO.DAK now in central Texas. Your flowering almond bush is stunning and I know just what you mean about the long upper midwest winters.... and I have lived here most of my life! Your pictures are so refreshing! 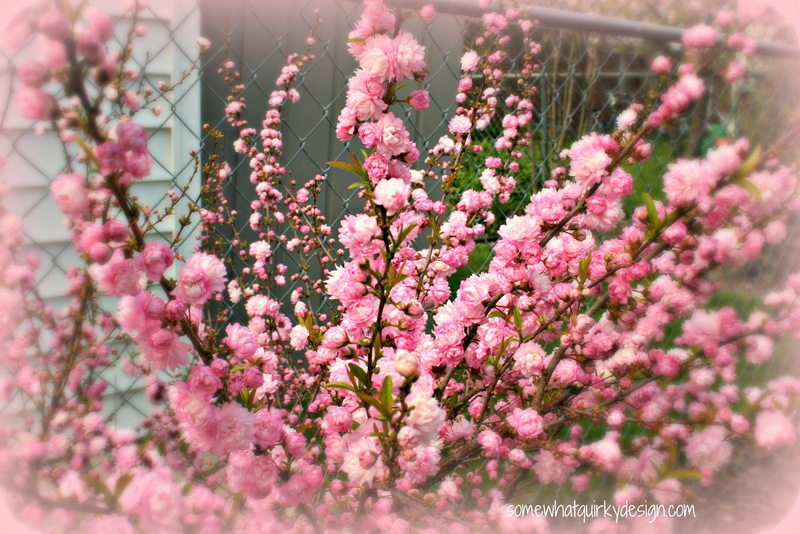 I just love this bush and I swear one day I'm going to get one, as soon as I figure out where I'm going to put it! My friend has one and she's calls it her cotton candy bush. Seems very fitting.